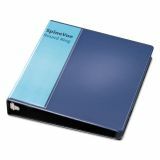 Cardinal Spine Vue Locking 3-Ring View Binder, 1 1/2" Capacity, Round Ring, Navy - Create custom binder in a third of the time. 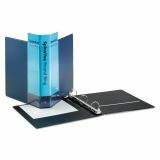 Exclusive wraparound clear vinyl overlay allows you to insert a single standard letter-size sheet, creating title information on all side of the binder. 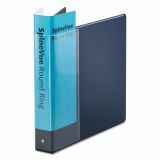 Leatherlike vinyl cover material with contrasting black lining adds professional premium look. SureLock round rings stay aligned so they won't accidentally open and spill contents. Horizontal pockets are inside front and back cover. 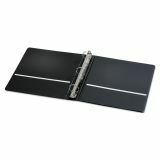 Binder offers a concealed rivet construction. Contains 45 percent recycled material. Free templates available.